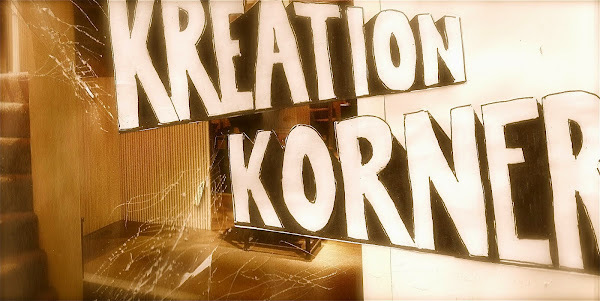 The Kreation Korner: Konspiracy Korner! 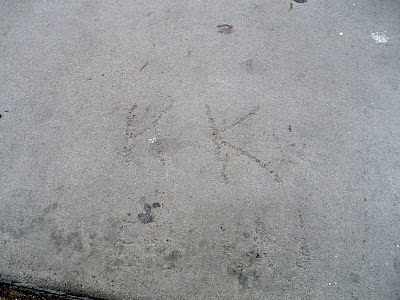 If you blur your eyes and move your head slowly toward and away from your monitor for a while, you should be able to compensate for this crappy photo and see the letters "KK" and "EW" carved into the cement. To say this is chilling is just the tip of the intrigue iceberg. "KK"? Hmm, those initials smack of a certain Korner we all know and love. The implications are alarming. What does "EW" stand for? Who left this mark? Why are they pulling our strings? What's their endgame? Is it a private organization or a limited liability corporation? These questions and more have been bandied about in and around the HQ and the answers are few and far between. When and where will the next calling card of this subversive brotherhood appear? We're of the mind that dwelling on it will only make us vulnerable. If we stand tall and undaunted, there's no question we'll be sorted with the sheep when the inevitable final showdown between pure, righteous Kreationism and wicked, perverse Kreationism occurs.